MCA Vinyl LPs were taken from the Original Master Tapes to make some of the greatest records in existence. 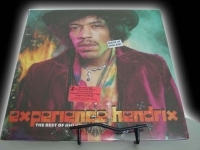 "The Music erupts out of total silence from these thick, 180 gram virgin vinyl discs with a velvety smoothness, spaciousness and ultra-high resolution that stuns even the most committed diehard." Michael Fremer - Contributing Editor, Sterophile. All MCA Vinyl LPs are Out of Print and considered to be some of the rarest pieces of vinyl anywhere. Don't miss out on being one of the last in the world to own one of these masterpieces. 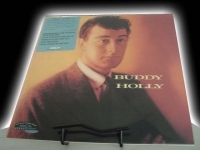 "Buddy Holly, Buddy Holly - 180 Gram"
MCA 180 Gram Virgin Vinyl Original Master LP "Out of Print, Last Copies" Tracks Include: "I'm Gonna Love You Too" "Peggy Sue" "Look at Me" "Listen to Me" "Valley of Tears" "Ready Teddy" "Everyday" "Mailman, Bring Me No More Blues" "Words of Love - 1:54 "(You're So Square) Baby I Don't Care" "Rave On" "Little Baby"
"Buddy Holly, His 20 Golden Greats"
BUDDY HOLLY - HIS 20 GOLDEN GREATS LP ON MCA. 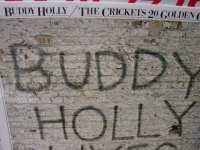 BUDDY HOLLY/THE CRICKETS - 20 GOLDEN GREATS LP -- In just eighteen months, Buddy Holly recorded 9 Top Ten smash hits. He was ahead of his time. He died before his time. His music lives on: Tracks include: That'll Be The Day - Peggy Sue - Words of Love - Everyday - Not Fade Away - Oh Boy - Maybe Baby - Listen to Me - Heartbeat - Think It Over - It Doesn't Matter Any More - It's So Easy - Well..All Right - Rave On - Raining in my Heart - True Love Ways - Peggy Sue Got Married - Bo Dudley - Brown Eyed Handsome Man and Wishing are all on this Greats LP. 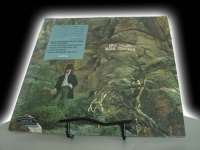 MCA 180 Gram Virgin Vinyl Original Master LP "Out of Print, Last Copies". Tracks Include: "Only You Know And I Know" "Can't Stop Worrying, Can't Stop Loving" "Waitin' On You" "Shouldn't Have Took More Than You Gave" "World In Changes" "Sad And Deep As You" "Just A Song" "Look At You Look At Me". 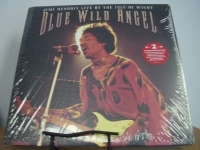 "Jimi Hendrix Experience, Blue Wild Angel (3 LPs) 180 Gram"
UK Pressed MCA Hendrix Original Masters 180 Gram Authorized Family Edition. 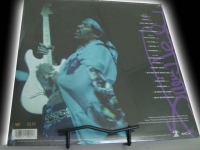 Hendrix captured here in August 1970. Tracks Include: "God Save The Queen" "Sgt. Pepper's Lonely Hearts Club Band" "Spanish Castle Magic" "All The The Watchtower" "Machine Gun" "Lover Man" "Freedom" "Red House" "Dolly Dagger" "Midnight Lightning" "Foxey Lady" "Message To Love" "Hey Baby (New Rising Sun)" "Ezy Ryder" "Hey Joe" "Purple Haze" "Voodo Child" "In From The Storm"
"Jimi Hendrix Experience, Smash Hits - #d - 180 Gram"
First Edition - Numbered Edition - Out of Print MCA Hendrix Original Masters 180 Gram Authorized Family Edition "Out of Print, Last Copies" Tracks Include: "Purple Haze" "Fire" "The Wind Cries Mary" "Can You See Me" "Hey Joe" "All Along The Watchtower" "Stone Free" "Crosstown Traffic" "Manic Depression" "Remember" "Red House" "Foxey Lady"
"Jimi Hendrix Experience,The Best of (#'d, 2 LPs)"
MCA Hendrix Original Masters 180 Gram Authorized Family Edition "Out of Print, Last Copies" Tracks Include: "Purple Haze" "Fire" "The Wind Cries Mary" "Hey Joe" "All Along The Watchtower" "Stone Free" "Crosstown Traffic" "Manic Depression" "Little Wing" "If 6 Was 9" "Foxey Lady" "Bold As Love" "Castles Made of Sand" "Red House" "Voodoo Child" "Freedom" "Night Bird Flying" "Angel" "Dolly Dagger" "Star Spangled Banner"
"Jimi Hendrix, BBC Sessions (1st Edition Numbered Series, 3 LPs) - CURRENTLY SOLD OUT"
MCA Hendrix Original Masters 180 Gram Authorized Family Edition "Out of Print, Last Copies". 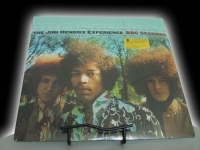 Tracks Include: "Foxey Lady" "Alexis Korner Introduction" "Can You Please Crawl Out Your Window?" "Rhythm And Blues World Service" "(I'm Your) Hoochie Coochie Man" "Traveling With The Experience" "Driving South" "Fire" "Little Miss Lover" "Introducing The Experience" "The Burning Of The Midnight Lamp" "Catfish Blues" "Stone Free" "Love Or Confusion" "Hey Joe" "Hound Dog" "Driving South" "Hear My Train A Comin'" "Purple Haze" "Killing Floor" "Radio One" "Wait Until Tomorrow" "Day Tripper" "Spanish Castle Magic" "Jammin'" "I Was Made To Love Her" "Foxey Lady" "A Brand New Sound" "Hey Joe" "Manic Depression" "Driving South" "Hear My Train A Comin'" "A Happening For Lulu" "Voodoo Child (Slight Return)" "Lulu Introduction" "Hey Joe" "Sunshine Of Your Love"
"Jimi Hendrix, First Rays (2 LPs)"
MCA Hendrix Original Masters 180 Gram Authorized Family Edition "Out of Print, Last Copies". 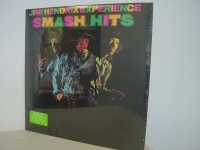 Tracks Include: "Freedom" "Izabella" "Night Bird Flying" "Angel" "Room Full of Mirrors" "Dolly Dagger" "Ezy Ryder" "Drifting" "Beginnings" "Stepping Stone" "My Friend" "Straight Ahead" "Hey Baby (New Rising Sun)" "Earth Blues" "Astro Man" "In From the Storm" "Belly Button Window"
"Jimi Hendrix, Jimi Plays Berkley (2 LPs)"
UK Pressed MCA Hendrix Original Masters 180 Gram Authorized Family Edition. 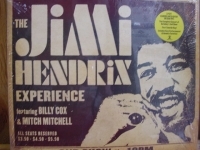 Featuring Billy Cox and Mitch Mitchell, here is the complete concert of Berkeley's second show from May 30, 1970. 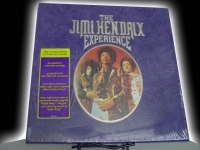 Tracks Include: "Introduction" "(Pass It On) Straight Ahead" "Hey Baby (New Rising Sun)" "Lover Man" "Stone Free" "Hey Joe" "I Don't Live Today" "Machine Gun" "Foxey Lady" "Star Spangeled Banner" "Purple Haze" "Voodoo Child"
"Jimi Hendrix, South Saturn Delta (2 LPs, rare #'d edition)"
MCA Hendrix Original Masters 180 Gram Authorized Family Edition "Out of Print, Last Copies". 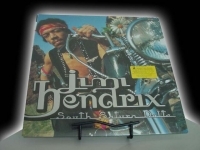 "South Saturn Delta", the new album from the legendary master, offers a comprehensive look at every phase of Jimi's career, covering three years of rare and astonishing recordings with the original Jimi Hendrix Experience. 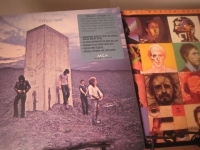 "The Who, Face Dances MFSL Factory Sealed and Who's Next MCA First Edition - 2 LP Set"